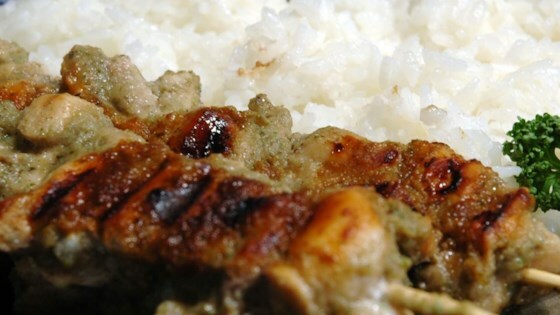 "Hot, succulent Jamaican Jerk Chicken is a tropical treat. You'll love the heat and flavor of this fiery marinade." Place chicken in a medium bowl. Cover with lime juice and water. Set aside. In a blender or food processor, place allspice, nutmeg, salt, brown sugar, thyme, ginger, black pepper and vegetable oil. Blend well, then mix in onions, green onions, garlic and habanero peppers until almost smooth. Pour most of the blended marinade mixture into bowl with chicken, reserving a small amount to use as a basting sauce while cooking. Cover, and marinate in the refrigerator for at least 2 hours. Brush grill grate with oil. Cook chicken slowly on the preheated grill. Turn frequently, basting often with remaining marinade mixture. Cook to desired doneness. POOR TASTE; LONG TIME TO MAKE. VERY POOR COMPARED TO AUTHENTIC JAMAICAN CHICKEN. This recipe simply did not fit my taste. It was tasty, but ended up tasting too much like ginger, and not much like jerk chicken. It might be better fitting for the right taste buds.